Living with a homestay family is the best way to immerse yourself in the language and culture of Austria and many students who choose this option consider it to be the most rewarding aspect of their time abroad. It is the best way to learn German, gain an authentic insight into Austrian culture and integrate into the local community. Each homestay is unique and individual – your host may be a single woman whose children have grown up and left home or a professional couple. Live in one of several residence halls throughout Salzburg. Each residence has double rooms with a private or shared bathroom, a direct phone line for incoming calls and a shared kitchen. Students who bring laptops or tablets can access the Internet from their rooms. For students who prefer a more independent living situation the shared apartment option is ideal. Apartments are located throughout the city in residential areas. Typically four AIFS students share a two-bedroom apartment with shared kitchen/living area and bathroom. They are not located in student blocks but are regular apartments with real Austrians as your neighbors. All students receive a meal allowance worth approximately $1,100 to subsidize the cost of purchasing food and meals. You can request to opt out of the meal allowance when you apply for the program and receive a reduced program fee of $12,395. Salzburg is the ideal location for students who love the outdoors. 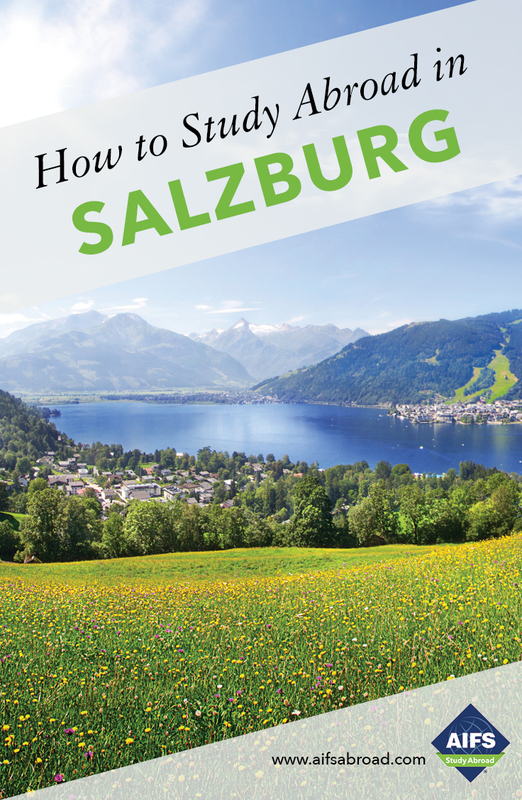 From Salzburg you can easily reach the mountains, meadows and lakes of the Austrian Alps. In the winter you can enjoy some of the finest downhill and cross country skiing in the world. The world-class ski areas of Kitzbühel and St. Anton are within easy reach. Other excellent resorts are easily accessible for half-day or day trips. In warmer weather you can climb, hike, raft, sail or windsurf locally. You will also have access to the University’s own program of events and activities. Maximize your opportunities to develop your German language skills outside the classroom by taking part in a language exchange with a local. Students of any level can participate and as well as improving your German it’s a great way to make friends and learn first-hand about the Austrian way of life in a relaxed atmosphere. ‘Kaffeekraenzchen’ Advanced German students can receive extra points in their German language course by participating in German Coffee Hour – an opportunity to discuss various topics with locals in a quiet coffee house. Guten Tag! Not sure what that means yet? Don&apos;t worry, during your semester, you will pick up much more than "hello". After being with AIFS since 1987 I am certain of that! I am of German-American descent, and was born and raised in Indiana. Every year my family and I would visit Germany, Austria, Switzerland and France, which prompted me to study abroad on this very AIFS program. During my time as a student, I learned a great deal about Austrians, Austrian culture and the language. I was so taken with this beautiful city that I returned to live here. While you are in Austria I will be working hard to ensure all aspects of the program run smoothly and am always happy to give advice on how to get the most out of your time abroad.